At the northern edge of the border between England and Wales the Manchester Ship Canal snakes its final miles along the southern banks of the River Mersey’s estuarine course to Liverpool. 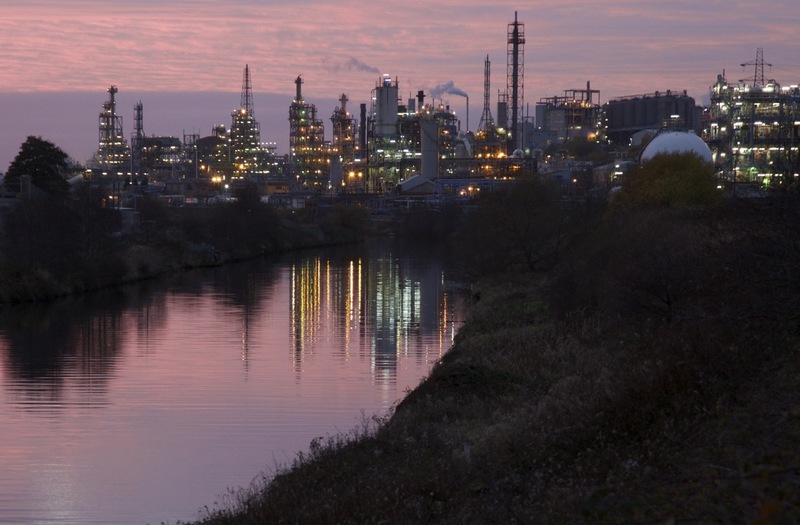 Hugging the edges of the Canal are the some of the remnants of England’s heavy industry, which once so dominated the entire area: from the Castner Kellner chemical works at Weston Point in Runcorn to the vast Stanlow oil refinery near Ellesmere Port – England’s second largest (1). Walking this area is a challenge as I found out one bright afternoon in late November: although there is a footpath through Runcorn’s petrochemical plants (2), it ends abruptly before one reaches the banks of the Ship Canal. One resident told me that the path had been blocked off and was now too overgrown; another warned me of a feral black panther that apparently prowls the industrial areas. Meanwhile, at Stanlow all public access is forbidden – the entrance to a private road that bisects the refinery warning casual drivers away, or not to stop or take photographs. 2. 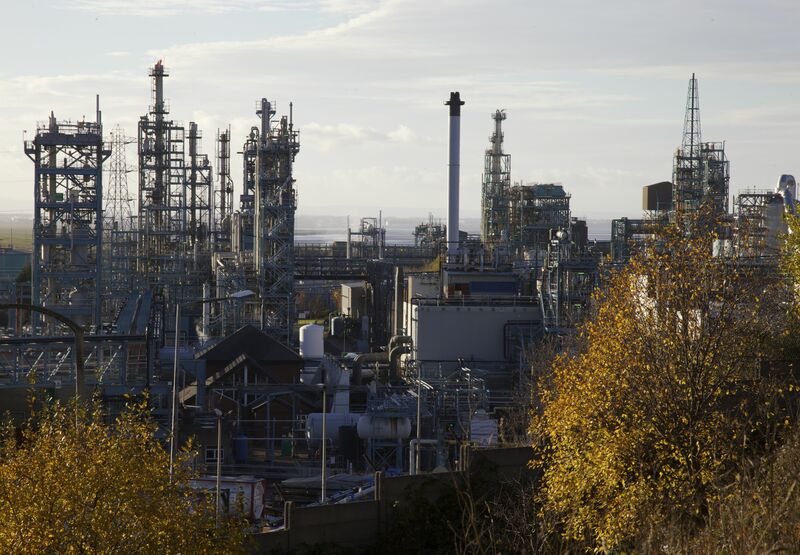 Runcorn’s chemical works from the footpath. 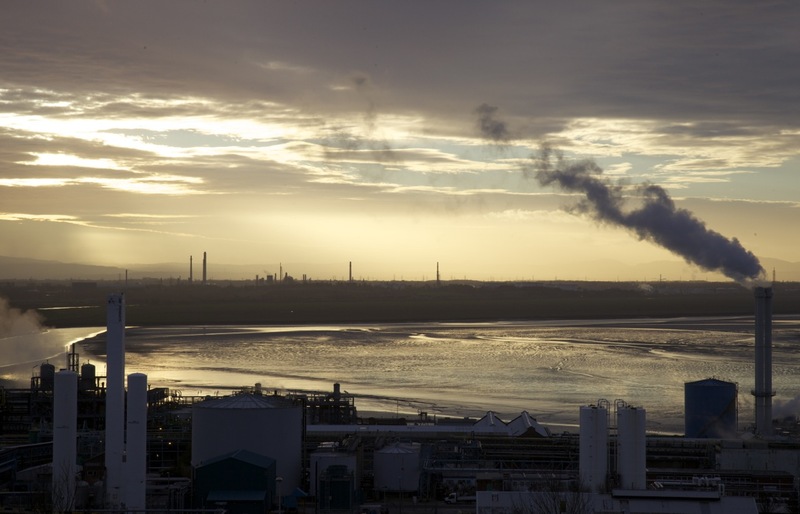 Yet, so vast are these industrial sites – Stanlow is the size of a small town – that they are visible for miles around, even if mostly ignored by the motorists speeding over the flatlands between England and Wales on the M56 (who are ordered to ‘Keep two chevrons apart’ from each other as if diverting them from glancing at the endless smoking chimneys beyond). Stopping to look at this heavy industry is clearly discouraged, even as most would probably have no interest in doing so anyway. But why is this the case? If we celebrate and flock to contemplate areas of outstanding natural beauty, why should we not do the same for their unnatural counterparts? 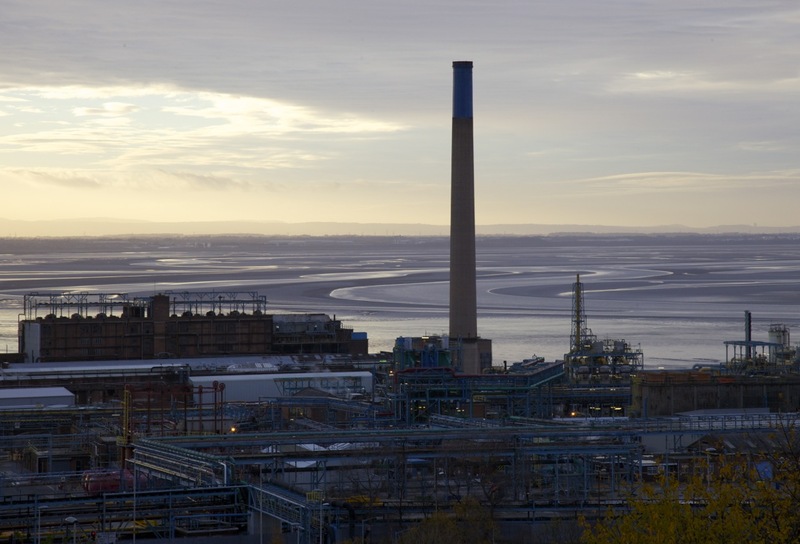 High on Runcorn Hill, the forms of the Castner Kellner chemical works provide an unnatural mirror of the river Mersey beyond (3). Just as the river creates a sublime aesthetics of ebb and flow, so the countless multicoloured pipes make visible their own mysterious currents and courses. As the sun began to set, the drifting smoke from the factory’s chimneys increased the natural drama unfolding beyond (4). 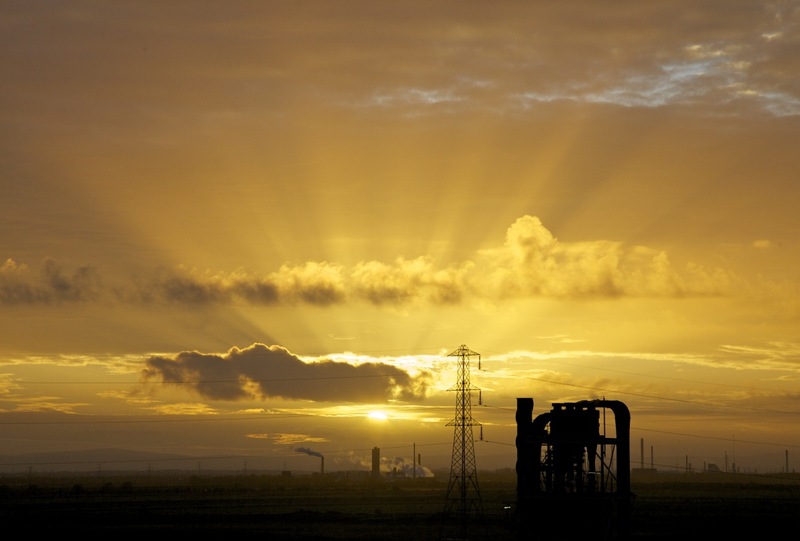 Later still, as the sun briefly shot out dazzling rays behind a bank of cloud, the now silhouetted forms of pylon, chimney and scaffolded pipework provided new aesthetic resonances – surreal, anthropomorphic forms that seemed to emerge out of the landscape itself (5). Then, in the aftermath of a glorious sunset, the red-soaked sky framed a fantastical vision of multicoloured lights and half-shrouded forms jumbled together like some fantastical city of the future (6). 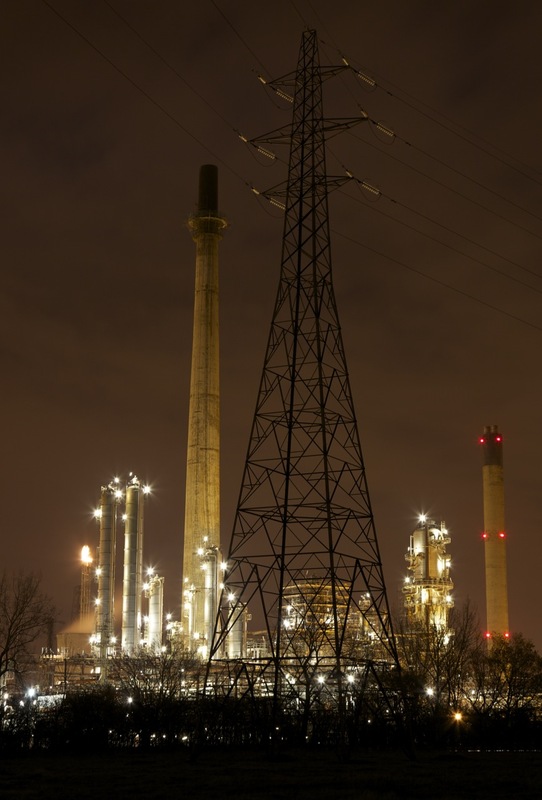 Finally, in darkness now, the forest of chimneys and pipes at Stanlow dazzled in their night-time raiment of white light, emerging behind marshy fields and bare trees like the vision of Los Angeles in Blade Runner (7). Does this enraptured gaze work against a more sober appreciation of the environmental costs of heavy industry? Or of its brutal economics – the reduction of human life to mere units of production? The 18th-century philosopher William Burke argued that, on the contrary, finding beauty in otherwise repellent objects is necessary because it allows us to hold a gaze that has the potential to dig deeper than mere appearances. Burke’s sublime gaze is one that leads to a more fuller awareness of the wholeness of human experience and the contradictory desires that govern it. Perhaps not to look – or to look merely with disdain – is ultimately far more damaging than a gaze that allows itself to be enraptured by what is usually scorned. I spent a few weeks a decade ago pouring over maps and plans of the refineries and their interconnections (physical, logistic and legal), but it wasn’t until speeding across the plain on a train to Liverpool years later that I saw this landscape ‘in the flesh’ and had to make sense of it in 3D. Realising that I already ‘knew’ it (from the plans) but was now seeing it anew made it all the stranger and impression-forming. As I squinted through the dirty window I could almost make out the hazardous installation safety zone demarcation lines that the maps told me existed, but which had no marker out on that marshy ground. Thanks Luke. My night shots were taken from a field just outside the perimeter fence. The smell at this distance is incredible & you wonder how that can possibly be good for anyone & yet there are houses very close by. Nice pics of industrial scenes. Are you familiar with the work of the Bechers — who photographed silos, water towers, winding gear etc ? BTW, for ‘repellant’, read ‘repellent’: the latter being the much more usual form. The photos of Stanlow brought back memories of my childhood as I lived just a couple of miles away from the refinery in Ellesmere Port. Once as an adventure me and a couple of friends cycled from our homes to the gates of Stanlow, but that was as far as we got! It’s a pity it’s all blocked off to the public now, but you can stiill get a train from Ellesmere Port to Helsby which takes you right through the heart of the complex. I did this journey a few years ago though there’s only about three or faour trains a day that make this journey. Thanks Mark. I’ll make sure I take that train ride! It does make an impression, especially at dawn, with the refinery lights glowing on the estuary banks. Do have a look at my aerial photo – WordPress does not allow me to post a direct link, but google ‘Jeziorki’ and ‘Mersey’. 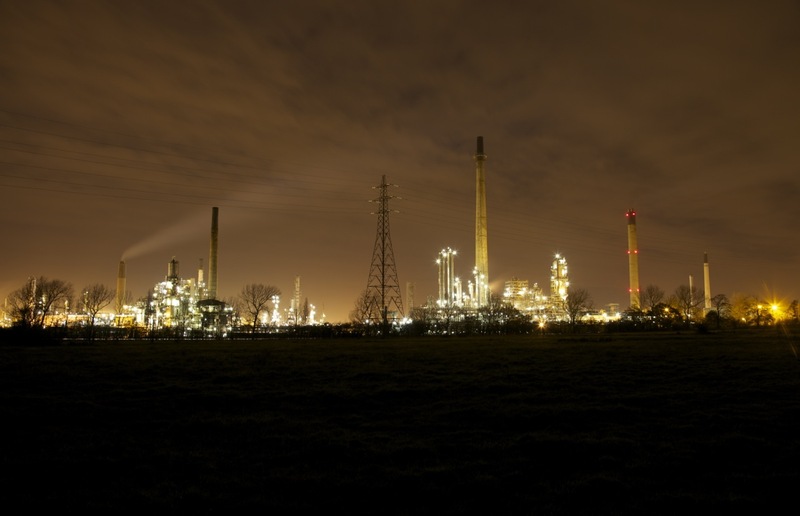 Great photos Paul and very evocative of the Grangemouth plant up here. This sits in a similar estuarine location with the other industrial behemoth – Longannet Power Station – on the opposite shore of the Forth. Both visible for miles around. In the darkness, it is difficult not to be utterly captivated by the dazzling, artificial white light, belching steam and orange flares which shoot into the sky. A curious mix of dark satanic mill and industrial city from the future. Love it! Maybe it is in the blood as my father worked on the construction of Grangemouth. I always look forward to going through Runcorn on the train and this puts it all in context with some great images too. Thanks Paul. Thanks Diana for your kind words. I met someone who lived across the Mersey on the edge of Liverpool who said that in his childhood the fire seen at Stanlow was known as ‘the eternal flame’ and that, should it go out, the world would end!